SINGAPORE — Asian markets were mostly higher on Thursday after a report that the U.S. had proposed a new round of trade negotiations with China quelled fears that a dispute between the world's two largest economies was spiraling out of control. KEEPING SCORE: Japan's benchmark Nikkei 225 added 0.8 percent to 22,787.33, and the Kospi in South Korea rose 0.1 percent to 2,284.74. Hong Kong's Hang Seng index jumped 1.4 percent to 26,711.07. The Shanghai Composite index gained 0.2 percent to 2,662.54. But Australia's S&P/ASX 200 shed 0.6 percent to 6,141.00. Stocks were higher in Taiwan and Southeast Asia. WALL STREET: U.S. stocks were mixed on Wednesday as technology companies fell, cancellng out gains in the energy sector. The S&P 500 index was less than 0.1 higher at 2,888.92. 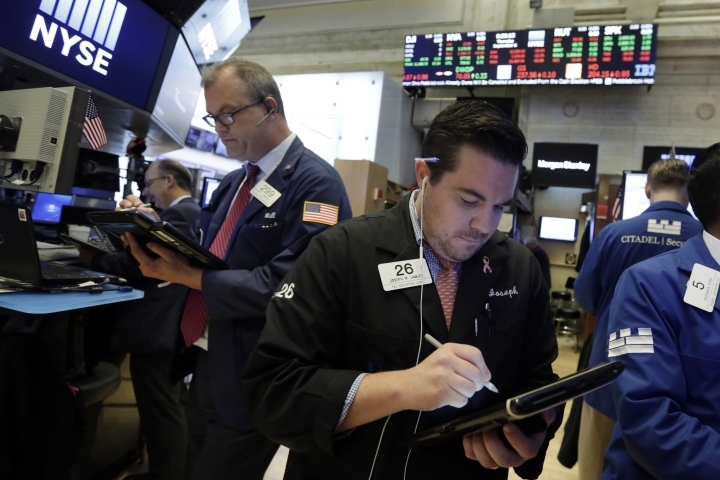 The Dow Jones Industrial Average gained 0.1 percent to 25,998.92. The losses for technology companies weighed on the Nasdaq composite, which slid 0.2 percent to 7,954.23. The Russell 2000 index of smaller-company stocks lost 0.2 percent to 1,715.70. US-CHINA RELATIONS: According to the Wall Street Journal, U.S. officials recently proposed a new round of trade negotiations with China. These would give the Chinese government another chance to address U.S. concerns before the Trump administration imposes bigger tariffs on goods imported from China, the report said. The two countries have already placed new taxes on $50 billion in imports, and the U.S. is threatening higher tariffs on $200 billion in goods and possibly more. China has vowed to retaliate and has put off accepting license applications from American companies hoping to operate in the country. It has also requested to be allowed to impose sanctions against the United States for failing to abide by a World Trade Organization ruling on anti-dumping measures. The case, which was recently taken up by WTO's dispute settlement body, centers on U.S. trade limits on Chinese products that the U.S. says are sold below market value. These include steel, coated paper, off-road tires, solar cells and diamond saw blades. ANALYST'S TAKE: "The shifting of the balance of trade negotiations away from the U.S. and towards the rest of the world and particularly China is starting to pull up markets," Michael McCarthy, chief market strategist at CMC Markets in Sydney, said in an interview. NEW iPHONE: Apple unveiled new iPhones with larger screens on Wednesday. The company also said new Apple Watches will have larger screens and new health-monitoring features. Its stocks, which tend to trade lower on the days it announces new products, fell 1.2 percent to $221.07 on Wednesday. Apple is up 31 percent in 2018, however. ENERGY: Oil prices eased after extending gains on the Energy Information Administration's announcement that U.S. crude stockpiles fell by more than 5 million barrels last week. Benchmark U.S. crude, which had reached its highest price in two months on Wednesday, dropped 50 cents to $69.87 a barrel. The contract climbed 1.6 percent to settle at $70.37 a barrel in New York. Brent crude, used to price international oils, shed 44 cents to $79.30 a barrel. It added 0.9 percent to $79.74 a barrel in London. CURRENCIES: The dollar strengthened to 111.38 yen from 111.22 yen. The euro rose to $1.1637 from $1.1632.